mwe3: After the success of the Watsons Riddle CD, what brought you back to recording your new CD Heat It Up as a solo artist? Did you take some of the tracks that might have worked on a new Watsons Riddle CD and decide to use them on your album? How would you describe the difference, musically and otherwise, between Heat It Up and the Watsons Riddle CD? Steve Watson: I felt that I wanted the creative freedom that comes from being a solo artist, rather than decisions being made by committee. I had written about half of the songs on Heat It Up while we had the Watsons Riddle band together but I was looking for more of a funky sound. Watson's Riddle was more or less a commissioned work where I had to make musical decisions that I might not have made if I were on my own. Heat It Up is really the music that I hear in my head. It is really me. mwe3: When was the music on Heat It Up written and recorded and what was the recording process like? Live in the studio or lots of overdubs and different recording locations? Steve Watson: The songs on Heat It Up were written between 2011-2013. The recording process started in January 2013 and was finished in June 2014. I have the freedom to record when I am creatively ready because I have a studio at The Fine Arts Center in Greenville, South Carolina and I have an overdub studio at WatsonWood Music. That is another reason I wanted to record this material as a solo artist. I didn't have to book a studio and feel the pressure of the clock ticking as we worked. I could record, listen and accept the work or redo it until I was satisfied. My recording process on Heat It Up was to record the basic song with a drum loop and me playing the guitars and bass. Then I brought in Big Tez Sherard and Greg Alewine to replace the drum loop and my bass part. Next, I did the keyboards, horns, and redid most of my original guitar parts. Other than the live drum and bass parts, which Eddie Howard recorded, I engineered all of the overdub sessions. Lucky for me I could call Eddie if I ran into problems. He is the Recording Arts engineering teacher at The Fine Arts Center. He was raised in the recording studio by his uncles who had a very successful Southern Gospel Studio in Greenville during the 1960s and 1970's. Eddie lived and worked in Nashville before moving back to Greenville. He is a pleasure to work with everyday. mwe3: Whats the chemistry like between you and the other members of the band that you recorded Heat It Up with including Greg Alewine on bass and drummer Big Ted Sherard? How did you put the band together on Heat It Up and who else plays on the CD with you? Steve Watson: I chose guys to play on the CD that I wanted to play in the live band. Hazen, Greg and I have been playing together for years. The chemistry in this band is great. We are all into making the music the most important thing when we are together. I have to give a big shout out to Big Tez Sherard, Greg Alewine, Hazen Banister, Doug Norwine and Rusty Milner. They have all gone way above the mark to make this project the best we could. Wendel Donald is a student of mine at The Fine Arts Center and a future star. He is 16 years old and an incredible talent. The kid plays keyboards, bass and drums. We love having him in the band. I am going to produce a record for him in the near future. Matt Olson, sax, and Keith Davis, keyboards, Furman University colleagues of mine, play on Left Turn In Space. Also, Mark Rapp plays trumpet and flugelhorn on the CD. mwe3: Last time we spoke you were talking about your jazz guitar school in South Carolina, The Fine Arts Center. Thats where you recorded the Heat It Up album as well. Whats the recording facility like there? The CD has a great sound so the studio must be quite good. Steve Watson: The Fine Arts Center is one of the premier Arts Magnet high schools in the world, led by Dr. Roy Fluhrer. We have a state of the art facility, which offers music, recording arts, visual arts, film, theater, technical theater, architecture and creative writing. My jazz studies program places young students in the finest jazz and commercial music schools in the nation. Our recording studio is Pro Tools HD with all of the state of the art plug-ins. But the most important thing we have is Eddie Howard as the teacher. He has great musical ears and is an excellent teacher. mwe3: The lead off track on Heat It Up is Remembering and it was written by you and keyboardist Hazen Bannister. How do you co-write music, for example this track with Hazen, and how and when did you meet up with Hazen? His keyboard parts really enhance your guitar sound on this track especially. Steve Watson: Hazen Bannister and I have been working together for about ten years. 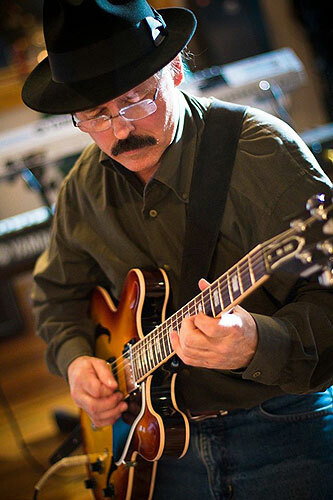 He is a former member of The Swinging Medallions from Greenwood, and he played in the Watsons Riddle live band. We were rehearsing for a jazz concert and playing this introduction to I Remember April and Hazen came up with this really cool melody. I felt I needed to write a song around that riff. So now we have Remembering. Hazens A Section and the rest is my stuff. Nothing like the original, it just came from jamming in G major. mwe3: The title track Heat It Up is very funky. Is that the funky direction you mentioned the music was going to take on the proposed second Watsons Riddle CD? Theres also a second guitarist on the album, Rusty Milner, who is also credited as being one of the executive producers on Heat It Up. Tell us about working with Rusty, who also did the mixing and mastering, and the part he played in the making of Heat It Up. 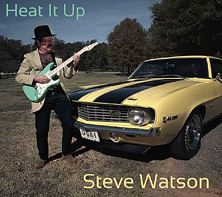 Steve Watson: Heat It Up is the funky sound I was talking about. It has elements of Memphis soul, edgy guitar, sax and a horn section. Rusty Milner is a delight to work with. 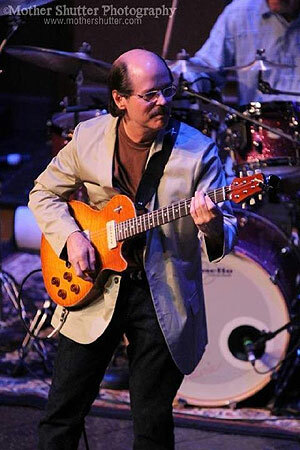 He recorded and mixed the Watsons Riddle record and he also played in the Watsons Riddle band. When I started working on this project I knew he was a valuable resource that I wanted to use. His musical ideas are great, his ears are to die for and his attention to detail is over the top. 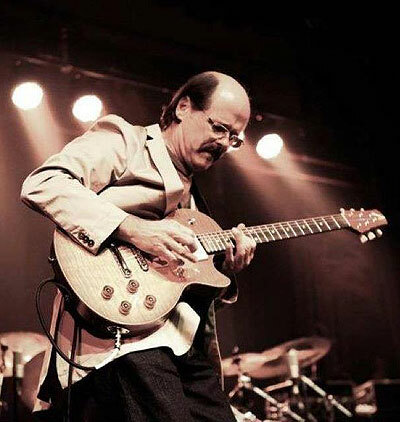 He played rhythm guitar, mixed and mastered this record, and is also playing live with us. Thats Rusty in the intro to Heat It Up. He and I wrote American Frontier. Rusty and Hazen were both in the Watsons Riddle live band. mwe3: Track 3 The Big White Dog has a driving kind of rhythm with some hot guitar playing. What is the inspiration behind that track and why did you call it The Big White Dog, especially as I know youre a cat fancier! mwe3: Mary Anna is track four. This track gets back to a kind of smoother jazz guitar sound. Is it more fun to write more upbeat tracks like this or the more wide screen soundtrack arrangements? Even if some of your music is breezy, you definitely transcend smooth jazz. 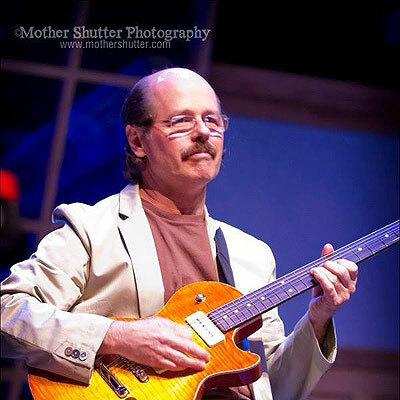 Steve Watson: I wrote Mary Anna with one thing in mind, smooth jazz radio. If you are going to exist as an instrumental artist and not play straight ahead jazz that is the format. Every record needs a single and that is what I was going for. It is one of the lighter tunes on the record but to me it doesnt compromise the harmony, melody or soloing. No one key pentatonic solos here. I am very proud of that tune especially the live version on You Tube with my intro. Check it out! My friend and co/producer Richard Smith had a lot to do with the final product on this one. Richard has been making great records in this format since the late 1980s. He just had a big hit with his record Tangos. I listened to everything he had to say... edits, tempo, etc. mwe3: Track 5 Wistful is kind of a different track for you in that it features acoustic guitar and is embellished by flugelhorn and a string section. Does this track get back to your soundtrack music sound with Mike Post? The song has a kind of soundtrack or even neoclassical sound to it. The Fine Arts Center String Quartet is featured here. Are those musicians from your school and tell us about Dr. Jon Jeffery Grier. Would you consider writing more music with strings in mind? Speaking of Mike Post, do you still speak with Mike? Steve Watson: I wrote this tune early in the Watsons Riddle days. It didnt make it on that record but I always liked it. The acoustic guitar was Richard Smith and Greg Alewines idea. The string section idea came to me one night while I was listening to a rough mix early in the process. I thought it would bring more air to the sound instead of the standard keyboard string part. Mike Post never came to my mind here. The form of an American Songbook piece was more what I had in mind. Dr. Jon Grier is the composer in residence and theory teacher at The Fine Arts Center. He wrote a great string chart and the Fine Arts Center students played really well. I havent spoken with Mike in a while. I worked a lot with him in the 1980s in LA. He gave me my first chance at playing in the real big time LA session scene. I will forever be grateful to him for that. I met him when I was playing with Bruce Hornsby. mwe3: Track six is Havin Fun and it kicks off the second half of the CD. The track features Wendel Donalds horn arrangements. Do you prefer working with horns or in a more trio / quartet kind of sound? What is involved in recording with horns? Did you record live with the horns in the studio or were they overdubbed? Steve Watson: I really prefer what works for the song. In this case, it was screaming for horns. We overdubbed them after Wendel played the parts on a keyboard - two trumpets and two saxophones. Hazen also added a lot to this one with his piano keyboard parts. mwe3: After Wistful and Havin Fun, track seven Shrimp And Grits gets back to a more stripped down Southern rock kind of sound. Theres a kind of Allman Brothers sound on the guitar sound. Did you double track your guitars or try to get a kind of Allman like effect on the guitars? Is Shrimp And Grits more of a classic Watsons Riddle type of sound? Steve Watson: Interesting that everyone hears this tune as that Southern rock sound. Thats what Roger Lifeset, my radio promo guy said as well. I hear it as an R&B soul song. To me its much funkier than Southern rock. The double tracking was really an afterthought. I was trying to make some passages stand out more. Again, our live You Tube version is really fun. My solo is really out, kind of like Miles Davis in the 1980s. I would say the CD version would be my choice for the second single. mwe3: Track 8, Left Turn In Space is one of the best songs on Heat It Up. It has some real hairpin musical turns. Is Left Turn In Space more of a jazz-rock fusion track as opposed to a more funky, smooth or Southern rock sound? What was the inspiration for Left Turn In Space? Great guitar solo in the middle of the track! Steve Watson: Left Turn In Space is a lot of fun. Its much more fusion than the rest of the record. I really enjoy soloing over a pedal point somewhat the same way John Coltrane and McCoy Tyner played over My Favorite Things in the 1960s. You could also think of the way Indian musicians solo over a drone. I took that concept and wrote a bridge with it. Matt Olson sounds awesome on the sax solo. He is a colleague of mine at Furman University. Thanks for the complements on the guitar solo. After Matt played, I went back and re-recorded my solo. His was so good, I couldnt let him top me. (lol) My solo has a real rock solo ending with the harmony stuff. I played the solo and harmonized it later. mwe3: Track nine Back To The Meade has a driving beat. What inspired the title? What is the Meade? This track has another kind of Southern Rock inspired sound. Steve Watson: Back To The Meade, well the title is really inspired from a Tower Of Power tune Back To Oakland. The Meade is the neighborhood I grew up in Greenville, South Carolina. Belle Meade, the same name as the famous neighborhood in Nashville. It is where I grew up listening with my friends to WHYZ, the only station in the area that played Otis, Carla, Wilson, James, and all of the soul artists. No white bubble gum stuff for me. I caught the R&B bug in the 7th grade and I have never lost it. So not Southern Rock to me at all. Its as close as I could get to a Tower of Power feel but with an aggressive guitar vibe. Doug Norwine sounds great on the sax solo here. He and I were session musicians in L.A. during the 1980s. We both played on the TV show Full House and we both ended up in the Upstate of South Carolina. mwe3: Track ten American Frontier closes out Heat It Up in style. Were you going for more of an anthemic kind of feel? The track kind of sounds like a soundtrack or theme song. How does American Frontier fit into your sound and style? Steve Watson: Sandy Shore mentioned in a review of the Watsons Riddle CD that we had the sound of Americana. So I set out to write a song with that feel. I was thinking of what Chuck Leavell would have played. He is such a soulful piano player, one of a kind. He ended up not playing on this track, but that is the story here. I thought the slide added a different sound than the rest of the record. I also had Doug Norwine play soprano sax on this one. The battle between the sax and slide at the end of the CD is a favorite moment for me. The CD ends with the slide going off into space. mwe3: You mentioned you were a gear head, so whats new and interesting in the guitar world for you? Are you playing the Tom Anderson guitars on Heat It Up? Any new modifications on the guitars? How about amps and strings and picks and other sonic enhancers that are also featured on the Heat It Up album? Do you have a favorite pedal or effect that you use to color your sound? 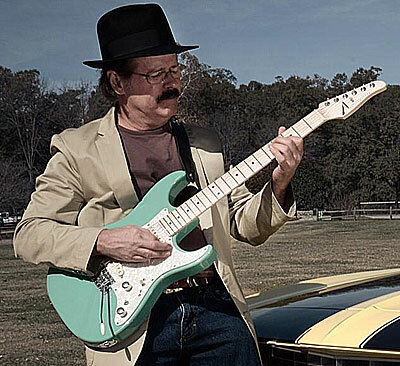 Steve Watson: This CD is all Tom Anderson Custom guitars. It includes my new Anderson Bulldog with P90s, my Hollow T Classic and my Classic Strat. They are the best playing, most in-tune guitars made. They make you forget about the instrument and just concentrate on the music. I used a Mesa Boogie studio pre-amp with a Mesa Boogie M190 power amp with a ported cabinet loaded with an EV12L. My live rig is the same but in stereo. My favorite pedal is a Timmie overdrive. It sounds so natural and is easy to EQ. All of my delays and compression on the CD are vintage style Pro Tools plug-ins. 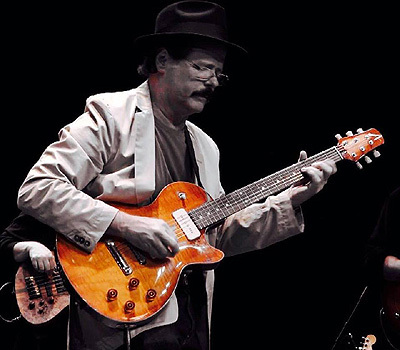 I use Jim Dunlap Jazz Tone picks and Elixir and SIT strings. mwe3: With so many things cooking in your career, such as your music and your teaching career, how do you balance your life? How do you spend your relaxing time? Steve Watson: I relax working in my backyard gardening with my wife Susan. I plan on spending as much time as I can with my new granddaughter, Perrin Elizabeth Hunter. mwe3: What other plans do you have for 2015? Touring, writing new music, recording... What kind of sonic direction would you like to go in next? Steve Watson: Plans for this year are to play live as much as possible to support this CD. I have a great band that can stand up and play with anyone.